JEL classification: F33, F36, F42, F65. Interest rates in core advanced economies, such as the United States, and those of emerging market economies (EMEs) and of smaller advanced economies move closely together, even though the business cycle has often been at different stages in these economies. For instance, as monetary policy eased in the United States in the wake of the Great Financial Crisis of 2007-09, short- and long-term interest rates also fell in countries not directly affected by it. And in May 2013, EME bond yields spiked in unison when the Federal Reserve signalled its intention to taper (ie scale down) its bond purchases. What drives this apparent correlation? Does it arise from synchronised business cycles or from other common factors that naturally drive interest rates in the same direction? Or, alternatively, does it reflect monetary spillovers, ie a direct impact of US interest rates on rates elsewhere, above and beyond what might be expected from other economic linkages? To date, the evidence has been mixed. While most agree that there are significant spillovers in long-term interest rates, the evidence for short-term interest rates is less clear. 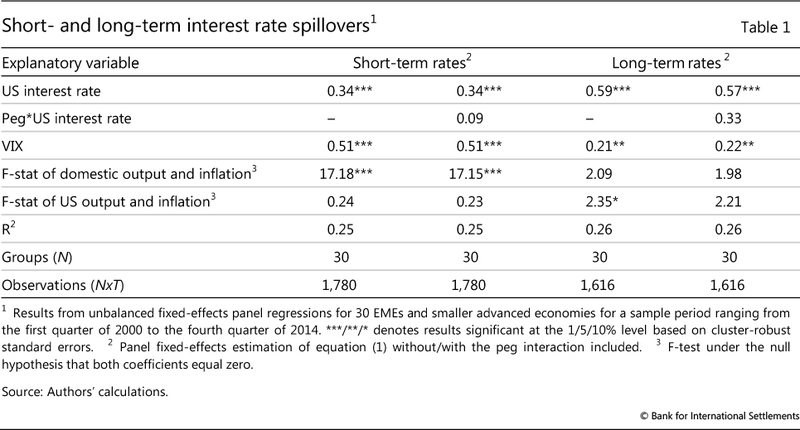 For instance, Obstfeld (2015) finds that there are significant interest rate spillovers in long-term rates, but not in short-term rates.2 In contrast, Gray (2013), Edwards (2015) and Takáts and Vela (2014) report evidence of significant spillovers in policy rates. In our empirical approach, we use standard panel regressions to analyse monetary spillovers, which we define as spillovers in short- and long term rates, and in policy rates. In all our specifications, we explicitly control for the impact of domestic and global macroeconomic factors, and for global financial factors that might drive the raw (unconditional) interest rate correlations. 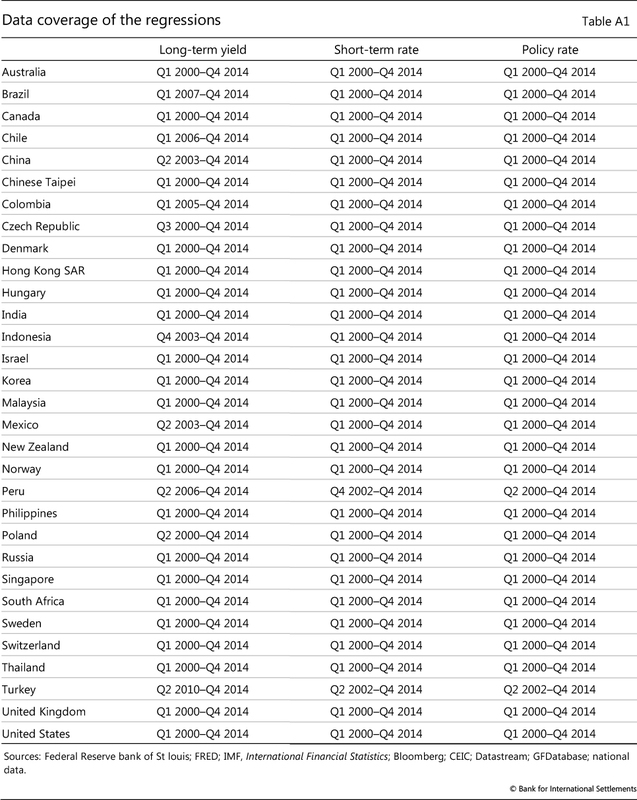 Our sample covers 22 EMEs and eight smaller advanced economies.3 We focus on the period ranging from 2000 to 2014 and, in order to match financial and macroeconomic time series, we use quarterly data. Our analysis differs from previous work primarily by focusing on economies that are well integrated in the global financial system and on the post-2000 period. Most previous studies included periphery countries that were only weakly integrated in the global economy and covered a longer period (starting in the early 1990s or even the 1980s). This difference in sample selection turns out to be important, because global financial and economic integration is a key driver of monetary spillovers. It determines the strength of investor arbitrage by tying bond market rates to those prevailing in the core economies. It also affects the degree to which policymakers might be concerned about capital flows and exchange rate volatility - concerns that would induce them to factor US interest rates into their monetary policy decisions. Hence, as countries differ substantially in how well integrated they are in the global economy, it is crucial to focus on the better integrated ones.4 Similarly, as economic and financial integration has significantly strengthened since the late 1990s,5 the subsequent period is the most relevant for our analysis. Incidentally, this time period also has the advantage for our analysis of not having been affected by major EME crises. The exclusion of such crises helps with econometric identification, as periods of stress were usually associated with strong idiosyncratic policy and interest rate movements, ie with large outliers in the data. From a policy perspective, our findings suggest that neither are interest rates fully independent nor is monetary policy fully unconstrained when economies and financial markets are closely integrated. Even under flexible exchange rates, central banks - though technically able - seem to find it difficult to conduct a monetary policy that is based purely on domestic factors and which ignores monetary developments in core advanced economies. Furthermore, our findings also shed some light on the causes of the persistently low interest rates that have prevailed globally over the past seven years. Back-of-the-envelope calculations based on our results suggest that easy monetary conditions in the United States have exerted considerable downward pressure on interest rates elsewhere. The remainder of the feature is organised as follows. Section 1 documents the (unconditional) correlations between US rates and those in EMEs and smaller advanced economies. Section 2 analyses price spillovers in short- and long-term interest rates, and Section 3 looks at spillovers in policy rates. Section 4 discusses the economic size of spillovers, and Section 5 concludes. 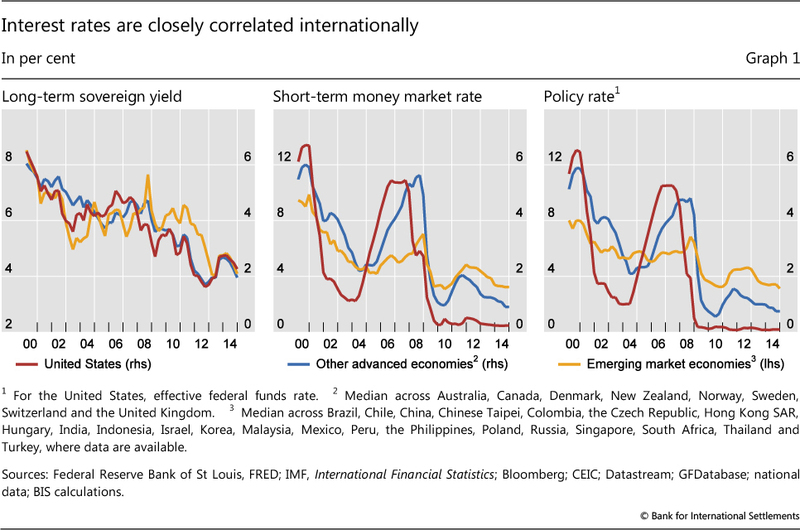 These correlations may reflect common economic and financial factors driving interest rates in a similar direction. For instance, shifts in international investors' willingness to take risks could move monetary conditions in a similar direction globally. And the evolution of the US business cycle is likely to directly affect global macroeconomic conditions via trade channels - implying global monetary responses that are similar to those in the United States. 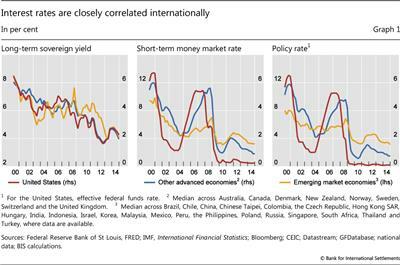 But alongside these channels, the observed interest rate correlations could also reflect genuine monetary spillovers. This could work through two channels. First, investor behaviour could tie interest rates together. Global investor portfolio reallocations might link the long-term rates of EMEs and smaller advanced economies to those of the core financial centres. Investors searching for yield might shift funds from low-yielding bonds in the core economies to higher-yielding bonds elsewhere, pushing those yields down. Similarly, cross-border bank flows motivated by search-for-yield considerations might give rise to spillovers in interbank rates. Second, monetary policies in EMEs and smaller advanced economies might follow those in the United States; in other words, there might be policy spillovers. For instance, central banks might want to prevent the emergence of large interest rate differentials to avoid exchange rate appreciation, which could result in a loss of trade competitiveness. Alternatively, they might be concerned that large interest rate differentials could induce speculative short-term capital inflows that could lead, in turn, to financial stability risks. In both cases, monetary authorities would aim to avoid large interest rate differentials against the rates prevailing in the United States. This would tie their policy rates to US policy rates, and, if market expectations then projected this linkage through the rest of the yield curve, other short- and long-term interest rates would follow. By themselves, the high observed correlations between interest rates do not necessarily imply that price or policy spillovers are in operation. In order to identify such spillovers, one needs to estimate the correlations that remain after controlling for the other potential economic and financial drivers of domestic interest rates - in technical terms, to go from unconditional to conditional correlations. We first estimate equation (1), excluding the peg interaction term, treating peggers and non-peggers alike and pooling all available observations (Table 1). The results confirm that both short- and long-term US interest rates drive the respective interest rates in EMEs and smaller advanced economies. The impact is both statistically and economically significant. With respect to short-term rates, the baseline estimates suggest that a 100 basis point change in the three-month US interbank rate induces a 34 basis point change in the three-month rates of EMEs and smaller advanced economies (Table 1, column (1)). Note that this impact is present after controlling for US and domestic macroeconomic factors, and the VIX. 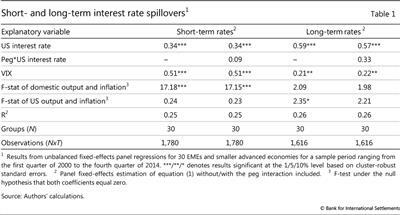 The finding of significant spillovers in short-term interest rates contrasts with the results of Obstfeld (2015), who found that spillovers in short-term interest rates were not significant. This difference does not stem from methodological choices but from differences in the sample investigated. Our sample differs from that of Obstfeld (2015) along three main dimensions. First, we are more selective with EMEs and include only those that are relatively well integrated in the global financial system. Second, our sample starts later, in 2000 as opposed to 1990. Our analysis thus focuses on a period of greater global financial integration. Moreover, as mentioned before, due to its later starting date our sample excludes a number of crisis episodes faced by EMEs, such as the Asian financial crisis of 1997, and is thus less affected by large outliers. Spillovers are even stronger for long-term bond yields: a 100 basis point change in the US 10-year government bond yield is associated with a 59 basis point change in 10-year bond yields elsewhere (column (2)). 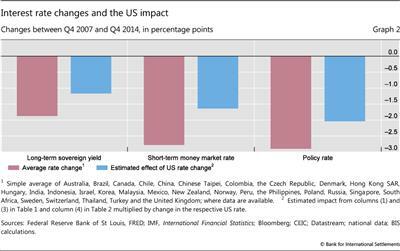 In other words, the impact of US rates is almost twice as strong for long-term rates as it is for short-term rates. This result confirms previous research, including Obstfeld (2015), that found significant long-term interest rate spillovers. It should be noted that for both our study and the research conducted by Obstfeld (2015), outliers related to the 1990s EME crises are less relevant for the estimations of long-term rates, since bond yields for many EMEs are available only from the early 2000s onwards. The economic and statistical significance of interest rate spillovers does not critically depend on whether the exchange rate is pegged. The peg interaction term remains insignificant if we include it in equation (1), both for short- and for long-term rates, implying that the spillover estimates for peggers and non-peggers do not differ in a statistically significant way from each other (columns (2) and (4)). Furthermore, the size and significance of the baseline coefficient for the US interest rate are not affected by the inclusion of the interaction term. This finding provides some empirical support for Rey's (2013, 2014) conjecture that, in practice, exchange rate flexibility might not shield countries from external monetary spillovers. The results also highlight the role of investor risk aversion, as proxied by the VIX. The VIX materially affects short- and long-term interest rates even after controlling for other factors (third row, Table 1). Higher risk aversion is associated with an increase in short- and long-term interest rates in EMEs and smaller advanced economies. This is consistent with the oft described impact of increased risk aversion: short- and long-term interest rates rise as investors retreat, capital flows ebb and exchange rates come under downward pressure. As discussed above (footnote 13), changes in US interest rates also influence investor risk sentiment, so that the estimated effect of the VIX on interest rates abroad also reflects in part indirect interest rate spillovers. Domestic macroeconomic variables also affect short-term interest rates in a significant way. Technically, the F-tests strongly reject the null hypothesis that the coefficients on domestic growth and inflation are zero for short-term interest rates (fourth row, Table 1). Long-term interest rates are, however, not significantly affected by domestic macroeconomic factors. Finally, the US business cycle is not a statistically significant driver of short- and long-term interest rates, ie the F-tests cannot reject the null hypothesis that the coefficients on the US macroeconomic variables are zero (fifth row, Table 1). This also indicates that the identified price spillovers do not result from an indirect impact of the US business cycle, beyond the impact exerted through US short-and long-term rates. To assess policy rate spillovers, we apply three different empirical setups that reflect the various approaches to the analysis of policy rate setting used in the literature. First, we estimate equation (1) with as the quarter-on-quarter change in the domestic policy rate and as the quarter-on-quarter-change in the effective federal funds rate. All the other variables are defined as before. This is basically a straightforward extension of the previous section's analysis of spillovers in market interest rates to changes in policy rates. where is the policy rate implied by a normative Taylor rule, while all other variables are defined as in equation (2). The Taylor rates are calculated for each country as i = r*+π* + 1.5(π-π*) + 0.5y, where π is a measure of inflation, y is a measure of the output gap, π* is the inflation target and r* is the long-run real interest rate, here proxied by real trend output growth. π* is set equal to the official inflation target/objective, and otherwise to the sample average or trend inflation estimated through a standard Hodrick-Prescott (HP) filter. The Taylor rates are calculated for each country for all combinations of four measures of inflation and three measures of the output gap to obtain a range and an average of possible Taylor rates. 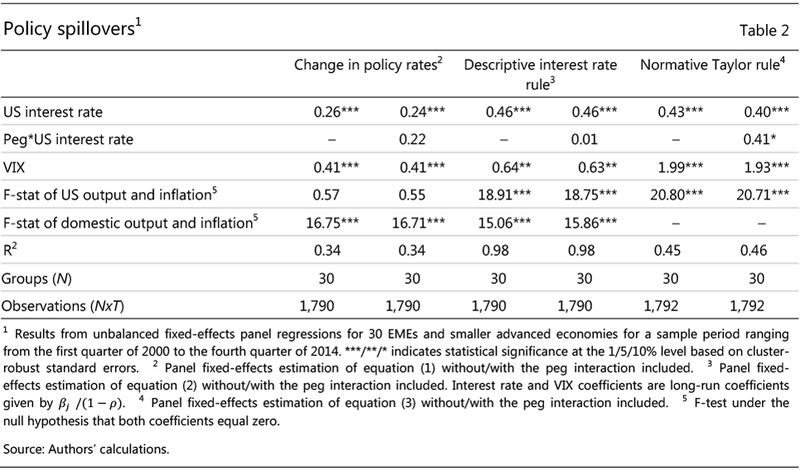 The results show economically and statistically significant spillovers from policy rates in the United States to those in EMEs and smaller advanced economies across all specifications (Table 2).19 The specification of policy rate changes suggest that a 100 basis point change in the federal funds rate is associated with a 26 basis point shift in the policy rate of EMEs and smaller advanced economies (column (1)), which is slightly smaller than the impact we found for changes in three-month interbank rates. In the descriptive interest rate rule, the estimated impact is somewhat larger, at 46 basis points (column (3)).20 The result is basically the same for the normative Taylor rule, with a 100 basis point change in the federal funds rate being associated with a 43 basis point shift in the policy rate of EMEs and smaller advanced economies (column (5)). Consistent with our findings in the previous section, we find only weak evidence that exchange rate flexibility might strengthen monetary policy autonomy. The estimated coefficients for the pegger interaction term are statistically significant only at the 10% level in the estimations of the deviations from the normative Taylor rule, while they are insignificant in the two other estimations (second row, Table 2). Global risk aversion, as proxied by the VIX, significantly affects policy rate setting even after controlling for US interest rates, US domestic macroeconomic variables and domestic macroeconomic variables (third row, Table 2). As expected, higher risk aversion is associated with higher policy rates. We also find evidence that monetary policy is driven not only by external factors: when estimating descriptive interest rate rules, domestic output gaps and inflation rates are significant drivers of monetary policy (fifth row, columns (2) to (4), Table 2). Technically, the F-tests strongly reject the null hypothesis that the coefficients on domestic macroeconomic variables are zero. This is not entirely surprising: evidence is accumulating - as documented, for instance, in Montoro et al (2012) and Takáts (2012) - that EMEs were able to respond countercyclically to domestic macroeconomic developments in the post-2000 period. Finally, for the specifications in levels, the results also suggest that the US business cycle significantly affects monetary policy in EMEs and smaller advanced economies, beyond its impact through US policy rates (fourth row, columns (3) to (6), Table 2). This could reflect that US macroeconomic conditions affect macroeconomic conditions elsewhere as well as global exchange rate and capital flow dynamics. However, this finding is not robust across all specifications. 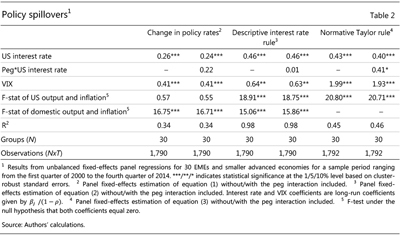 In the case of the specification in policy rate changes, US macroeconomic variables do not have a significant effect (fourth row, columns (1) and (2), Table 2), consistent with what we found in the case of three-month interbank rates. Our estimated spillover effects, along with being statistically significant, are also large from an economic perspective. For instance, depending on the chosen interest rate and specification, a 100 basis point change in US interest rates implies a 26-59 basis point change on average in the respective rate elsewhere. Taken at face value, this result suggests that the steep fall in US interest rates between end-2007 and end-2014, of roughly 440 and 480 basis points, respectively, in policy and short-term rates, and roughly 200 basis points in long-term interest rates, had a major impact on global interest rates (in addition to its impact on global growth and inflation). Back-of-the-envelope calculations based on our estimation results confirm this intuition (Graph 2). Interest rates declined substantially in this period worldwide: on average, long-term sovereign yields declined by around 190 basis points (left-hand panel) and short-term rates and policy rates dropped by 280 and 290 basis points, respectively, in our group of EMEs and smaller advanced economies (centre and right-hand panels, respectively). Combining our coefficient estimates with changes in the corresponding US interest rates allows us to quantify in a rough manner the impact of changes in US interest rates on interest rates elsewhere over this period (blue bars). The calculations suggests the existence of broad spillover effects of average changes in US rates between end-2007 and end-2014 of roughly -120, -160 and -200 basis points, respectively, for long-term bond yields, short-term interbank rates and policy rates. However, the size of the impacts in Graph 2 should be taken with appropriate caution. In particular, the large estimated impact of US rates over the seven-year period does not mean that such rates were the dominant drivers of foreign interest rates throughout. In more technical terms, the impact estimates should not be interpreted as proper decompositions, as the regressors in equations (1) to (3) are not perfectly uncorrelated. We find economically and statistically significant monetary spillovers from the United States to EMEs and smaller advanced economies. 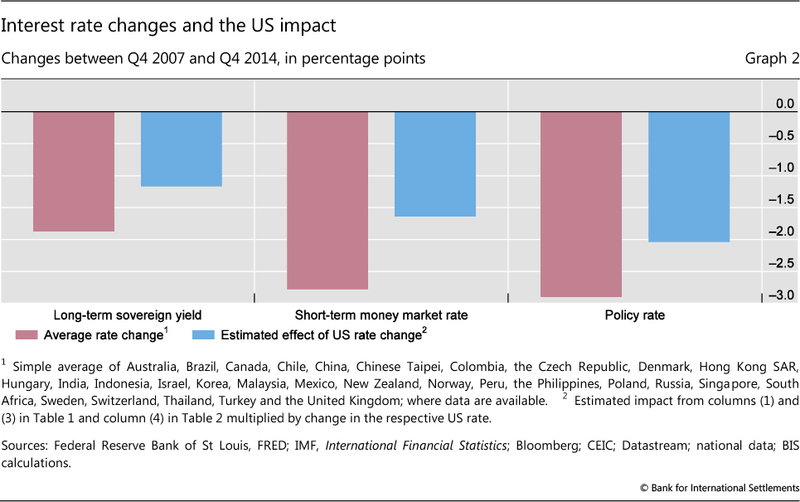 US short- and long-term interest rates significantly affect the corresponding rates in other economies. We further find that these spillovers reflect in part policy rate spillovers, ie that US policy rates affect policy rates in other countries. These results are obtained while controlling for US and domestic macroeconomic conditions and movements in the VIX. Thus, monetary conditions in the United States affect monetary conditions elsewhere beyond what similarities in business cycles or global risk factors would justify. Our findings further suggest that in economies that are closely integrated in the global economy and global financial markets, financial conditions are not independent. Interest rates in the core financial centres are important driving factors. At the same time, monetary policy appears to be constrained. Even under flexible exchange rates, central banks seem to find it difficult to conduct a monetary policy that is based purely on domestic factors and that ignores monetary developments in core advanced economies - although they are technically capable of doing so. This probably reflects the trade-offs that central banks face: in internationally open economic and financial systems, large interest rate differentials, even if vindicated by domestic economic conditions, could still lead to excessive capital inflows or strong exchange rate appreciations - which could, in turn, pose risks to either financial stability or trade competitiveness. Our findings also shed some light on the causes of persistently low global interest rates over the past seven years. Back-of-the-envelope calculations suggest that easy monetary conditions in the United States have significantly lowered interest rates elsewhere. This finding supports the notion that global monetary spillovers have been an important factor behind persistently low global interest rates. The policy question going forward is whether non-US central banks will follow US monetary policy as the Federal Reserve starts to raise the policy rate. Our results suggest that spillovers are present when the Fed tightens, which is supported by the fact that our sample period includes the Fed's tightening cycle of 2004-06. Yet, some caution is warranted. It might well be that spillovers are not fully symmetrical: for instance, policymakers might tolerate exchange rate depreciations or short-term capital outflows better than appreciations and inflows. Or they might be even more sensitive about them. Hence, while our results provide evidence on past spillovers, one should be cautious in applying them to predict potential future spillovers. Bank for International Settlements (2015): 85th Annual Report, June, Table V.C, p 91. Bruno, V and H S Shin (2015): "Capital flows and the risk-taking channel of monetary policy", Journal of Monetary Economics, vol 71, pp 119-32. Chen, Q, A Filardo, D He and F Zhu (2015): "Financial crisis, US unconventional monetary policy and international spillovers", BIS Working Papers, no 494, March. Edwards, S (2015): "Monetary policy independence under flexible exchange rates: an illusion? ", The World Economy, vol 38(5), May, pp 773-87. Gray, C (2013): "Responding to a monetary superpower: investigating the behavioral spillovers of US monetary policy", Atlantic Economic Journal, vol 41(2), June, pp 173-84. He, D and R McCauley (2013): "Transmitting global liquidity to East Asia: policy rates, bond yields, currencies and dollar credit", BIS Working Papers, no 431, October. Hofmann, B and B Bogdanova (2012): "Taylor rules and monetary policy: a global 'Great Deviation'? ", BIS Quarterly Review, September, pp 37-49. Miyajima, K, M Mohanty and J Yetman (2014): "Spillovers of US unconventional monetary policy to Asia: the role of long-term interest rates", BIS Working Papers, no 478, December. Montoro, C, E Takáts and J Yetman (2012): "Is monetary policy constrained by fiscal policy? ", BIS Papers, no 67, October, pp 11-30. Nickell, S (1981): "Biases in dynamic models with fixed effects", Econometrica, vol 49(6), pp 1417-26. Obstfeld, M (2015): "Trilemmas and trade-offs: living with financial globalisation", BIS Working Papers, no 480, January. Pesaran, M and R Smith (1995): "Estimating long-run relationships from dynamic heterogeneous panels", Journal of Econometrics, vol 68(1), pp 79-113. Rey, H (2013): "Dilemma not trilemma: the global financial cycle and monetary policy independence", paper presented at the 25th Federal Reserve Bank of Kansas City Annual Economic Policy Symposium, Jackson Hole, Wyoming, August. --- (2014): "The international credit channel and monetary autonomy", Mundell-Fleming Lecture, IMF, 13 November. Takáts, E (2012): "Countercyclical policies in emerging markets", BIS Quarterly Review, June, pp 25-31. Takáts, E and A Vela (2014): "International monetary policy transmission", BIS Papers, no 78, August, pp 25-44. Taylor, J (1993): "Discretion versus policy rules in practice", Carnegie-Rochester Series on Public Policy, no 39, pp 195-214. Turner, P (2014): "The global long-term interest rate, financial risks and policy choices in EMEs", BIS Working Papers, no 441, February. Turner, P and J Sobrun (2015): "Bond markets and monetary policy dilemmas for the emerging markets", BIS Working Papers, no 508, August. 1 The views expressed are those of the authors and do not necessarily reflect those of the BIS. We thank Claudio Borio, Ben Cohen, Dietrich Domanski, Hyun Song Shin and Christian Upper for helpful comments, and Emese Kuruc for excellent research assistance. 2 Turner (2014), Turner and Sobrun (2015) and Miyajima et al (2014) also confirm strong correlations and potential spillovers via long-term rates. He and McCauley (2013) highlight the role of dollar-denominated credit as a source of spillovers. Chen et al (2015) also find significant spillovers, but they document substantial heterogeneity in these effects among EMEs. 3 The EMEs covered by our analysis are Brazil, Chile, China, Chinese Taipei, Colombia, the Czech Republic, Hong Kong SAR, Hungary, India, Indonesia, Israel, Korea, Malaysia, Mexico, Peru, the Philippines, Poland, Russia, Singapore, South Africa, Thailand and Turkey. The smaller advanced economies sample comprises Australia, Canada, Denmark, New Zealand, Norway, Sweden, Switzerland and the United Kingdom. 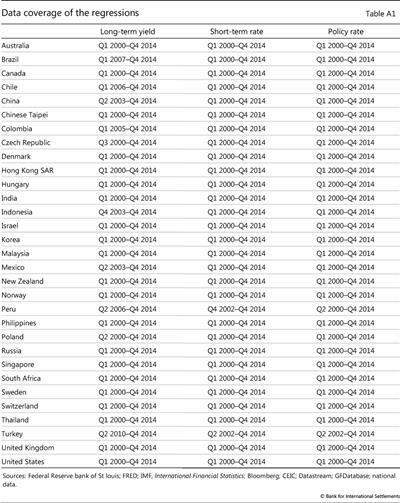 Importantly, we do not include countries from the euro area, the other large currency zone. 4 For instance, taken together, the EMEs included in our country sample represent more than 95% of the weights of the JPMorgan Government Bond-Emerging Market Index (GBI-EM), a key local currency EME government bond index. 5 Specifically, the international investment position of all countries has increased, from below 100% of global GDP in 2000 to above 150% by 2013. Over the same period, world trade, measured as the average of export and imports, rose from below 20% to around 25% of global GDP. 6 We also conducted the analysis using country-dependent base currencies, specifically using the euro area as the base currency area for European EMEs and smaller advanced economies and the United States for the remaining countries. The results turned out to be very similar to the ones with the United States as the general base country. They are available upon request. 7 Specifically, Rey (2013, 2014) suggests that the global financial cycle has turned the classical "trilemma" of international macroeconomics into a "dilemma". Instead of a free capital account and an independent monetary policy being feasible only under flexible exchange rates ("trilemma"), an independent monetary policy and a free capital account would be incompatible under any exchange rate regime ("dilemma"). 8 Average correlations are calculated for the period Q1 2000 to Q4 2014 for our country sample as listed in footnote 3 and Annex Table A1. 9 The equation can be derived from the uncovered interest rate parity condition as shown in Obstfeld (2015). 10 Short-term rates are proxied by money market rates when interbank data are not available. Furthermore, short-term rates reflect shorter maturities for Russia (31-90 days) and Chile (30-89 days). Long-term yields reflect yields of seven- to 11-year bonds in Brazil and of nine-year bonds in Chile. 11 US short-term rates have been at near zero levels since 2009. This raises the question of how the inclusion of these observations affects our results. It turns out that estimating the spillover equations using data up to Q4 2008 yields results that are very similar to those obtained over the full sample. 12 The results do not change materially if we use a softer definition of a peg with a wider fluctuation range of +/-5%. 13 The VIX itself might of course be influenced by changes in US interest rates; see eg Rey (2013, 2014) and Bruno and Shin (2015). By controlling for the effect of the VIX on foreign interest rates, we isolate the interest rate spillovers that are additional to those of the VIX. 14 Following Obstfeld (2015), exchange rates are not directly included in the set of control variables since the expected change in the exchange rate is seen as being endogenously determined by interest rates and the other control variables. 15 Here, policy spillovers are understood in a behavioural sense, ie they arise from the reaction of monetary authorities in recipient countries (say, out of concerns about the impact of external developments on exchange rates and capital flows). While we focus on spillovers in policy rates, in a broader sense, they have also occurred through long-term interest rates via large-scale asset purchases and forward guidance. These unconventional policies have increasingly driven long-term rates in core financial centres since the onset of the Great Financial Crisis and have influenced long-term rates elsewhere through the long-term rate spillovers documented in Table 1. 16 Output gap estimates are calculated from quarterly data using the standard Hodrick-Prescott (HP) filter with a smoothing parameter of 1,600. 17 The inclusion of a lagged dependent variable, which is standard in the literature for capturing interest rate smoothing by central banks, can give rise to biases in our panel estimation. First, Nickell (1981) has shown that dynamic panels with small time series dimensions are biased, with the size of the bias depending inversely on the size of the time series sample. Second, fixed-effects estimators of dynamic panels can be biased if there is heterogeneity in the slope coefficients across countries (Pesaran and Smith (1995)). In our application, these biases are, however, likely to be small. The time series dimension of the panel model is relatively large, which should mitigate the Nickell bias. At the same time, the coefficient of the lagged endogenous variable (ie the degree of interest rate smoothing) is fairly homogenous across countries and not very far from one (the panel coefficient estimate is 0.83), which should mitigate the heterogeneity bias. Excluding the lagged dependent variable from equation (2) could help avoid these biases in the panel estimation, but this might in turn give rise to omitted variable biases since the other variables might proxy for the omitted lagged domestic interest rate. 18 The Taylor (1993) rule is a simple monetary policy rule mechanically linking the level of the policy rate to deviations of inflation from its target and of output from its potential (the output gap) through fixed reaction coefficients. While it was initially proposed as a simple illustration for the United States of desirable policy rules that had emerged from the academic literature at that time, it has become a popular normative benchmark against which to assess the monetary policy stance also in EMEs and smaller advanced economies. 19 In order to assess the impact of the near zero policy rate period since 2009, we also re-estimated the policy spillover equations using data up to Q4 2008 only and found the results again to be very similar to those obtained over the full sample. 20 The long-run impact is given by β1 /(1 - ρ). When equation (3) is estimated without the lagged domestic interest rate, the estimated impact of the US policy rate is somewhat larger, at 0.7 (BIS (2015)), potentially reflecting omitted variable bias as indicated in footnote 17.